Non-invasive evaluation of myocardial ischemia remains a priority in cardiology. The preferred initial non-invasive test is exercise electrocardiography (ECG) in patients who are able to exercise to an adequate workload (of at least 85% of age-adjusted maximal predicted heart rate and five metabolic equivalents) because of its high accessibility and its low cost. It allows for a physiologic assessment of functional capacity, symptoms and hemodynamics. When compared to pharmacologic stress testing, exercise is associated with less extensive hepatic and gastrointestinal tracer uptake, which significantly improves image quality . However, for several reasons plain exercise ECG may not be adequate and in such conditions it should be combined with an imaging modality (Table 9.1) to increase the sensitivity and specificity of diagnosis. Henzlova MJ, Cerqueira MD, Hansen CL, et al. 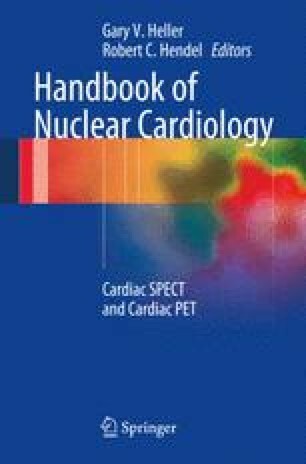 ASNC imaging guidelines for nuclear cardiology procedures: stress protocols and tracers. J Nucl Cardiol. 2009. http://www.asnc.org/imageuploads/ImagingGuidelinesStressProtocols021109.pdf. Accessed 7 July 2009.